Beach with silhouettes of tourists among palm trees on the island of Boracay. Palm trees in the rays of sunset. Sailboats on the water. Philippine Tropics. 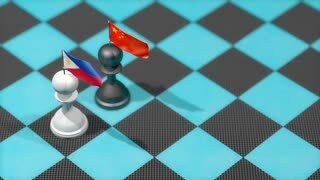 Chess Pawn with country flag, Philippine, China.